A great 1-1/4 hr. 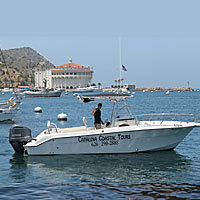 Eco-Tour/Dolphin & Sea Lion Excursion along Catalina's beautiful coastline - a very personalized tour where you meander along the coast aboard a comfortable 24' tour boat with only 6 passengers. You'll see beautiful secluded coves, learn about the Island, and most likely encounter dolphins and sea lions, cormorants, pelican, heron, bald eagles, flying fish, and sometimes whales! All Old Turner Inn guests receive a 10% off. 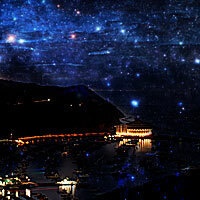 Led by passionate amateur astronomer, Kathleen Hill Carlisle, who takes you up to beautiful Buena Vista Point overlooking Avalon Bay, for an educational tour of the night sky. Learn about the history of astronomy, star lore and mythology, how to find constellations, and a basic understanding of our solar system and the galaxy. Kathleen uses her large 8" telescope to show off the planets and Moon. You will gain a new appreciation of the universe- and our place in it. Kathleeen has been featured in Sunset and Westways magazines, and is a regular guest lecturer at USC Wrigley Institute for Environmental Sciences at Two Harbors, Catalina Island. All Old Turner Inn guests receive 10% off. Enjoy a private massage from one of the best massage therapists anywhere - Lavina Jones of Avalon Massage Therapy. You'll relax in our on-site studio - just steps away from your room at the Inn. 10% off for Old Turner Inn guests. Let us book a Couples Massage for you at a discounted price of $160 (reg. $175), just call or email us and we will arrange it all! There are lots of great restaurants in town - just ask us. Most don't require reservations, but on busy summer nights - or Jazz Trax, it's a good idea to get them. 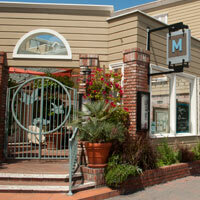 You can peruse the menus as you stroll along front street, then pick a restaurant for the evening. 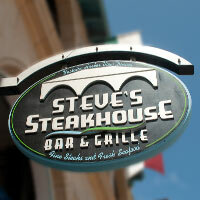 Steve's Steakhouse - Lunch or dinner, Steve's specializes in seafood & steak, and is located upstairs with arched windows overlooking the bay. We always get great feedback from guests that eat at Steve's. 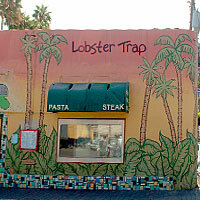 The Lobster Trap - is open for lunch and dinner. They have great seafood - lower prices and bigger portions. They also have probably the best clam chowder anywhere - a cup is plenty! The atmosphere is like a sportsbar, so don't go here for a quiet, romantic meal. 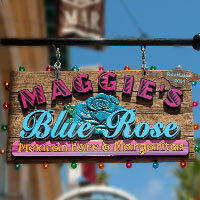 Maggie's Blue Rose - Next Door to Steve's, you will find, some of the best Mexican quizine on the whole island. delectable burritos, enchiladas, fish tacos and Carne' entrees of many different varieties. Enjoy a View of the beach and a cool ocean breeze as you sit back and relax at this wonderful gem of Crescent street. The M Restaurant/Zest Catering - don't miss a chance to eat Chef Kathleen Vojkovich-Bombard's unique twist on everything! If they are open, it is by far some of the best food in town. LIMITED OPENINGS. Reservations recommended 310-510-8404. The Villa Portofino - Fine Italian dining and great seafood combined with an elegant atmosphere. 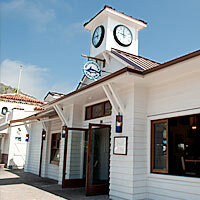 The Bluewater Avalon - Lunch or dinner. The best thing about this restaurant is its location. The only restaurant on Front Street with a beautiful patio over the water. They specialize in seafood. Their 3-6 happy hour in the winter is a great bargain. Cafe Metropole - Lunch. Great place for a wide selection of sandwiches, soups and salads. Very fresh and tasty. Outdoor seating. Vegetarian, Vegan, and Gluten Free selections. Catalina Brew House - Lunch. Not a full service restaurant, but a great place for an afternoon snack - and to people watch from the open patio on Front Street. They offer a limited selection of sandwiches, savory and sweet pastries, and soup each day. They bake their breads fresh for their sandwiches and homemade PIZZAS. And their homemade pretzels (ask them to heat them up) are AMAZING! CC Gallagher's - is a wine & espresso bar with unique gifts - and sushi & paninis. They also have the best desserts in town - with flown in pastries and Viadoce gelato. Great spot to hit up after dinner for a glass of wine or hot tea and a dessert. They are open late. Their affiliate next door is CC Beau Deli - they serve Boars Head cheese and La Brea Bakery bread. 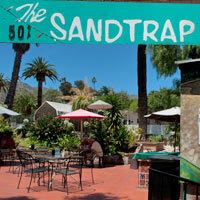 The Sand Trap - $1 tacos & $2 beers after 2pm. It has a nice outdoor patio up the canyon by the golf course, and is often warm and sunny when it is chilly down on the waterfront. These are very basic street taco, but order some chips and salsa to go with it, and you've got a great afternoon meal. Buffalo Nickel Restaurant - "Pasta Night" Mondays. 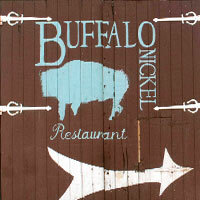 If you are here on a Monday night, the best place to eat is at the Buffalo Nickel. For $14.95, you get to serve yourself from a well stocked salad and soup bar (best salad we can find in town), and then enjoy one of the chef's sauted specials cooked on a gas stove at the buffet just for you. Choose whatever you want - shrimp, scallops, chicken, mahi mahi, bells peppers, fresh garlic, mushrooms, tomatoes, onions... Then, they add noodles, and you pick a sauce - red, white or pesto. Yum!! Call 310-510-1323 for a free ride to the restaurant.